On finishing with the glass of water, the planet rotates back to its original position. Once you click on the doodle, the search engine takes to articles talking about the historic discovery of evidence of water on the moon. “Today’s news stirred us like a long, cool drink in the blistering heat. Science has gestured at the presence of water on Mars before, but evidence of liquid water–briny, creeping flows that appear in a crater during Martian summers–has tremendous implications in the search for life beyond our planet. 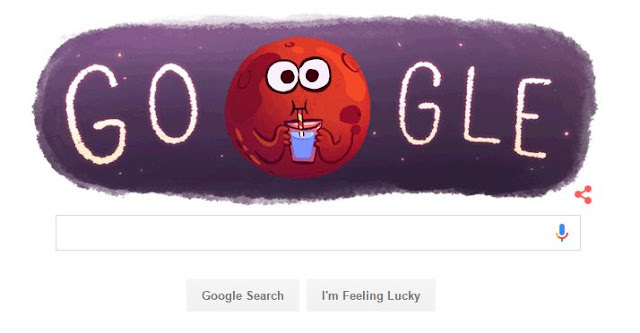 We felt compelled to honor such an exciting discovery with a Doodle, and staring at satellite images of Mars for inspiration made Doodler Nate Swinehart really, really thirsty,” Google explains on its doodles page. The discovery has been suggesting that the planet could be home to some form of life, according to NASA researchers.